If you get a Nail in your tire, you should remove it as soon as possible. You can drive short distances with a nail in your tire but you should not just leave it there and continue to drive for a long period of time. It is very unsafe for not only you but the other drivers you share the road with as well. 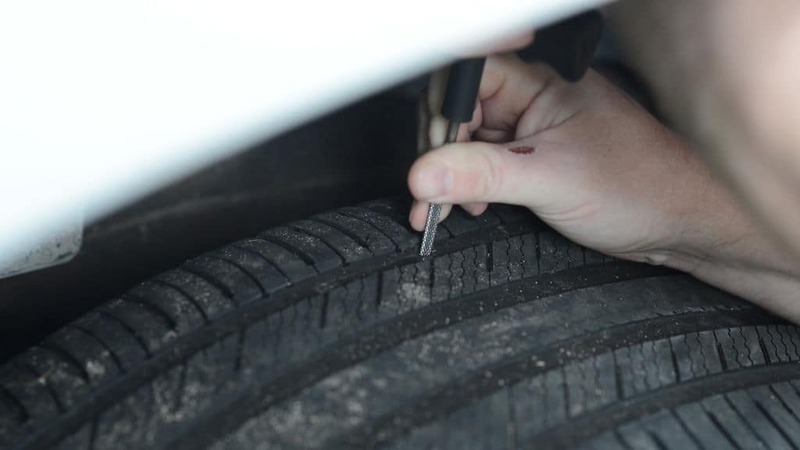 Our goal with this guide is to breakdown the process of removing a Nail in Your Tire step by step, so anyone can do it (which you can completely can)! Is It Safe To Drive With A Nail In Your Tire? The answer is simple: Yes you can drive A SHORT DISTANCE with a nail in your tire. However, the Nail must be REMOVED. You can't drive with a nail in your tire for a long period of time, it is not safe. If you notice a nail in your car's tire, the most important thing to do before touching it is to estimate its depth. Try to stop by the first available tire center immediately. 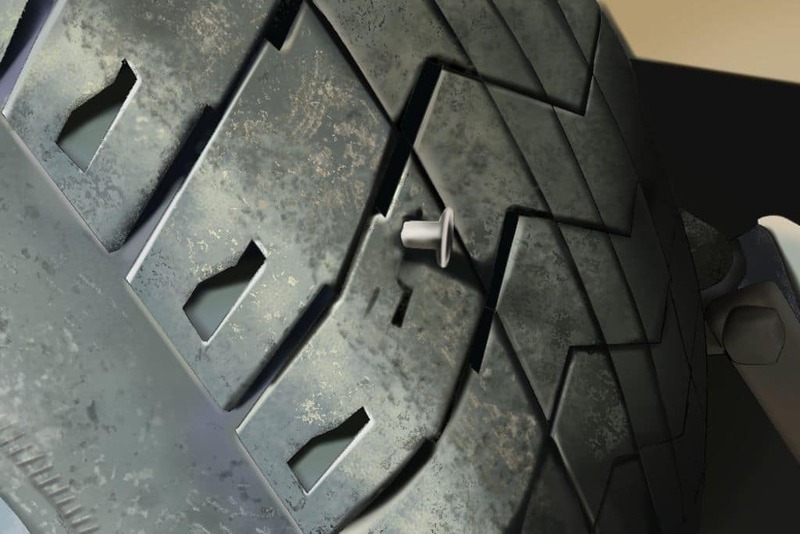 If there's no tire shop nearby, keep in mind that the more you drive with a nail in the tire the more it will get damaged. Usually, unless you're in the middle of nowhere, there will be an Autozone, Auto Parts store, Tire shop, Convenience store, or even a Gas station that will sell a Tire Plug kit. 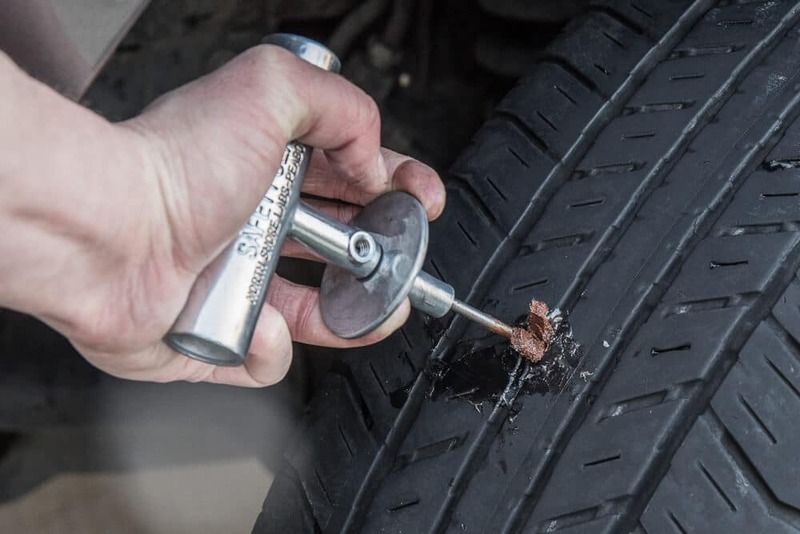 Buy the tire plug kit and in the next section, we're going to show you how to remove the nail and plug the tire, don't worry it’s very simple. Many times this will be easy to spot because you'll see a large screw or nail sticking out, however, if you don't its time to try other ways of finding the leak. The easiest alternative method would be to spray a bubbly solution (such as window cleaner) on the tire, fill it back up with air, and look for the bubbles that the leaking air makes. That will show you exactly where the leak is. If It is a screw, simply unscrew it with a drill or screwdriver. 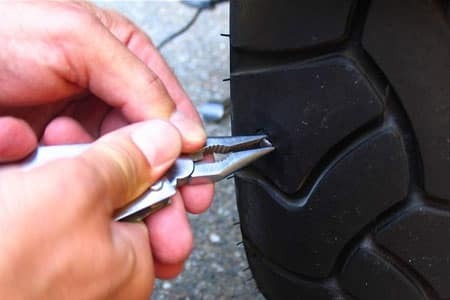 If it is a nail, try to use a claw hammer, vice grips, of a pair of pliers to get the nail out of the tire. Don't worry if the tire goes flat or makes a hissing sound, that’s just the air coming out (we're going to refill it when we plug it, so it’s not a big deal). When you have removed the nail or screw, now its team to "Ream" the hole. Most tire plug kits come with a tool that has a "file" at the end of it. Push this tool in and out of the hole a few times to rough out the hole. Once the hole is reamed, you'll see another tool the looks like a needle. Take your plug and crimp it between the end. Now you’re ready to seal the hole once and for all! Take your plug threaded needle and insert it into the hole. Push it in with some force until there is only a little bit of the plug left sticking out. Then you should be able to yank the plug tool out of the tire and the plug should stay in the hole. Also, trim the end of the plug that is sticking out as close to the tire as you can. One other thing to keep in mind is its not a good idea to put multiple plugs or patch on a tire. If you have patched (plugged) the tire once already if it gets another hole, just get a new tire at that point. Don't compromise your safety! 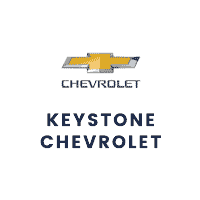 For the state of art repair and maintenance in Tulsa, OK, Keystone Chevy service center is always recommended. Apart from repair services, Keystone Chevy’s service center also has a rich stock of tires of all brands. Our product specialists and expert technical staff are readily available to guide you to which tire set is most appropriate for your vehicle. Buy a tire set from us and enjoy free tire inspection and rotation for life. This will not only give you high quality brand new tires but also save your precious and hard earned money. Stop by or reach out to us now with any questions, concerns, or help you might need with your vehicle's service.